I love this clip cord—I’ll never use anything else! Extremely light!!! Makes a huge difference in machine movement. Very easy to wipe down as well. It’s so light and love that it doesn’t stick to covers. Fits my Dan kubin machines perfectly, will always recommend these over any other clip cord out there. In all seriousness I've gone through so many clip cords over the years, and I'm never satisfied. The Featherlite Mamba Clip Cord is the BEST clip cord I've ever used, and the price is beyond reasonable for the quality. I love the shape of the clips themselves, it slides down the clip cord sleeve with ease, and it's so light I don't even feel like it's there. 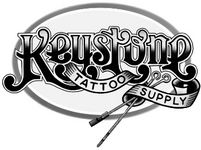 Many Thanks to Keystone Tattoo Supply! I have so much good stuff to say about this clip cord. It's very light, the cord itself doesn't stick to the plastic sleeves or itself like silicone cords do, and the tension spring on it is actually flexible allowing it to easily fit in any machine without force or scratching up your machine.